It’s time for football! Kpreps.com kicks off the 2018 season with the release our Kpreps.com Top 5 rankings. So, let’s get started! Take a look at our preseason rankings and let the debate begin! 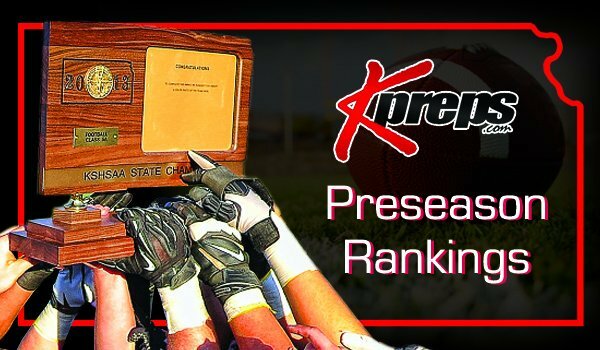 But first, our annual disclaimer: the Kpreps rankings are a collaborative effort from multiple media sources across the state and will be released each Monday throughout the season. Derby opens the season as the top-ranked team in Class 6A for the third consecutive year. The Panthers reached a third consecutive 6A state title game last season, but came up short in a 49-42 loss to Blue Valley North. Derby has averaged more than 11 wins per year over the past six seasons. The Panthers return eight starters including a pair of quarterbacks with significant playing experience. Lawrence Free State checks in at No. 2 to begin the season. The Firebirds have been eliminated by Derby in each of the past three seasons, but may be among the most talented teams in the state. The Free State offense returns heavily-recruited lineman Turner Corcoran (6-6, 270) who will lead the way for Kpreps All-State running back Jax Dineen. For the second consecutive season, Blue Valley and Blue Valley North open the poll at Nos. 3 and 4, respectively. Blue Valley posted an 8-4 season in 2017 and reached the state semifinals, while their EKL counterparts at Blue Valley North captured the 6A state title with a 49-42 win over Derby. Blue Valley returns 15 total starters from a year ago, while Blue Valley North returns one of the nation’s top quarterbacks in Graham Mertz. All Mertz did during his junior campaign was pass for 3,684 yards and 45 touchdowns. Finally, Shawnee Mission East rounds out the poll at No. 5. The Lancers have undergone a couple of coaching changes since last playing in 2017. When Dustin Delaney resigned at the end of the season to take a job in Colorado, SM East hired Fred Bouchard – a five-time state champion coach from Missouri. But late this summer, Bouchard accepted a job in Illinois and the Lancers turned to new offensive coordinator Justin Hoover. Hoover, of the nation’s top QB coaches, will have a talented roster that includes QB Andy Maddox and four returning offensive linemen. New to Class 5A, Wichita Northwest opens the season as the classification’s top-ranked team. The Grizzlies have among the most talented rosters in all of Kansas. Running back Breece Hall, an Iowa State commit, returns for his senior season after rushing for more than 1,900 yards and 30 touchdowns a year ago. He’ll be joined by quarterback Reagan Jones who passed for more than 1,500 yards as a sophomore at Andover Central last season. The defense is anchored by Oklahoma-commit Marcus Hicks and returning all-state linebacker Josh Carter. St. Thomas Aquinas will open the season at No. 2. The Saints reached the 5A title game last season before falling to Bishop Carroll, 38-28. Aquinas will again look to capture the school’s first state football title. While only 7 total starters are listed, make no mistake that the talent is on roster for another deep playoff push. Reigning 5A champion Bishop Carroll checks in at No. 3 to open the season. The Golden Eagles return 14 total starters from last year’s title team, highlighted by all-state tight end Clay Cundiff. The primary question surrounding Carroll will be consistency at quarterback in attempting to replace 5A All-State selection Braden Howell. The Golden Eagles open at home with No. 1 Wichita Northwest. Mill Valley opens the season at No. 4 in the poll. The Jaguars bring back experience with 17 total starters returning. Gone is all-state quarterback Brody Flaming, but Lawrence Free State transfer Jordan Preston is expected to step in behind center. Finally, Maize edges out a few teams in a close vote to grab the No. 5 spot in the poll. The Eagles are coming off a 9-2 season that saw them reach the state quarterfinals before falling to Bishop Carroll, 26-14. Maize returns 12 total starters including standout quarterback Caleb Grill who has committed to South Dakota State to play basketball. Bishop Miege has dominated Class 4A-I en route to state titles in each of the past four seasons. The Stags return plenty of talent to be considered the favorite for a fifth consecutive title, but they’ll have to replace all-everything quarterback Carter Putz. Putz finished as the all-time leading passer in state history with 9,295 yards and 125 touchdowns. He was a three-year starter with a 37-2 record, and was named the Dylan Meier-Get Busy Livin’ Player of the Year in 2017. The new Stag quarterback will have plenty of talent to give the ball. Brison Cobbins returns in the backfield after a 1,300-yard season, while receivers Daniel Jackson and Phillippe Wesley may be the best duo in the state. McPherson begins the season at No. 2 after reaching the state semifinals last season. The Bullpups were largely led by a stingy defense a year ago, but now return eight offensive starters for 2018. Quarterback Kyler Hoppes passed for 2,000 yards a year ago, and Jace Kinnamon added 1,000 yards on the ground. The third and fourth ranked teams are both new to the classification. Third-ranked Goddard and No. 4 Pittsburg have each enjoyed successful playoff runs in recent years. Goddard nearly won the 5A title in 2016 and reached the state semifinals again last year. Meanwhile, Pittsburg reached the quarterfinals last year before falling to Aquinas. Both the Lions and Purple Dragons have the talent returning to make their presence known in their new classification. Finally, Labette County rounds out the poll at No. 5. The Grizzlies lost two games a season ago, to 4A-I champion Bishop Miege and runner-up Andale. Quarterback Easton Dean is a talented player that has committed to Iowa State. The Grizzlies will have to play well early as they open at No. 4 Pittsburg this week. This year’s 48-member Class 3A was formed by combining the former Class 4A, Division II and the largest 16 teams in the former Class 3A. The result of that chaos, is likely the deepest classification in Kansas high school football. Five schools in this classification played in state football championship games a season ago; Andale (4A-I), Holcomb & Frontenac (4A-II), and Marysville & Sabetha (3A). With all that being said, it is Andale that opens atop the Kpreps poll to begin the 2018 season. The Indians return several talented players from last year’s runner-up team, including South Dakota commit, Mason Fairchild. Defending Class 3A champion Sabetha is slotted in the No. 2 spot to open the poll. The Bluejays got a late interception at the goal line to defeat Marysville 7-6 in last year’s title game. This year’s Sabetha squad returns more than 3,000 rushing yards and should be well-equipped to challenge for another title. Scott City opens the season at No. 3. The Beavers return 14 total starters including a standout two-way player in Wyatt Hayes. Hayes rushed for more than 1,000 yards last season, and earned all-state honors as a defensive end. Fourth-ranked Hesston returns one of the top QB-RB combinations in the state. Quarterback Cameron Cox amassed more than 3,100 total yards last season, while RB Parker Roth rushed for nearly 1,900 yards and 26 touchdowns. Topeka Hayden rounds out the Top 5 at No. 5. The Wildcats lost several talented players from last year’s squat, but return a solid nucleus up front and five starters on defense. Hayden will only play three games in the Centennial League given the expanded six-team districts in Class 3A. Phillipsburg may have been the most talented team in Class 3A a season ago, but was ousted by Marysville 30-24 in the state semifinals. The Panthers return atop the Kpreps poll to open 2018 with a four-year starter in Trey Sides at quarterback. Traditional powers Conway Springs and Silver Lake begin the season at No. 2 and No. 3, respectively. Conway Springs returns a solid group up front, but must replace 2,000-yard back Trenton Jones and 1,200-yard quarterback Colton Terhune. Meanwhile, Silver Lake returns QB Mason Griffin who passed for more than 1,800 yards last fall. Nemaha Central was ranked No. 1 for a good portion of the season a year ago before losing to Silver Lake, 25-7 in the second round of the 3A playoffs. The Thunder took some tough hits to graduation, but return two solid backs in Noe Gauna and Luke Reitz. Finally, Hoisington opens the season at No. 5 after making it to the second round a season ago. The Cardinals return sophomore quarterback Mason Haxton as well as standout players Wyatt Pedigo and Riley Philbern. Hoisington opens the season with a challenging game against a strong Class 3A contender in Pratt. Smith Center dominated the competition last season on its way to another state title. The Redmen surrendered only six points per game a season ago. Graduation took its toll, including all-state defensive end Dalton Kuhn and several others. Smith Center returns nine total starters and should again be a factor in the state’s smallest 11-man classification. Centralia slides into the No. 2 spot to open the season. The Panthers reached the state quarterfinals before falling to No. 3 St. Mary’s Colgan. These two sets of Panthers are scheduled to meet in Week 4 of the regular season. Elkhart opens the season ranked fourth. The Wildcats have high expectations in returning seven starters on each side of the ball, including all-state quarterback Lane Whisennand. Whisennand rushed for more than 2,000 yards and passed for 1,200 more yards last season. The Olpe Eagles round out the poll at No. 5 this season. Olpe reached the state semifinals a season ago before falling to Colgan. The Eagles return 11 starters including all-state back Blaine Hinrichs. In Class 8-Man, Division I, the defending champion Hoxie Indians open the season in the top spot. Hoxie captured its first state football title with a 54-14 victory over St. Paul last season. The Indians return a huge offensive line that features Jarrod Dible (5-11, 220), Colton Heskett (6-2, 215), Taye Washington (6-5, 335), and has added sophomore Harlan Obioha (6-8, 310). Central Plains opens the season in the second spot. The Oilers will feature one of the most talented group of skill players in 8-Man football. Myles Menges returns at quarterback after throwing for 1,000 yards and 19 touchdowns. Leading rusher Alex Hickel and all-state defensive back Devin Ryan also return. Another Central Prairie league member checks in at No. 3. Victoria made the long road trip to Burlingame to open the playoffs last season. The Knights challenged the Bearcats before eventually falling, 34-24. Victoria returns the talented Cooper Windholz at quarterback. Victoria opens the season against 8M-II No. 4 Otis-Bison this week. Fourth-ranked Hodgeman County moves up to 8-Man, Division I after finishing as the Division II runners-up a season ago. The Longhorns challenged D-II power Hanover in the title game before falling 54-48. Hodgeman County will have to replace four-year starter Jacob Salmans at quarterback, but his brothers Isaac and Eli are both expected to make key contributions. Finally, Solomon rounds out the poll at No. 5. The Gorillas return a lot of talent from a team that suffered through several injuries to finish 5-4 a season ago. Senior quarterback Braden Nielson is a three-year starter and one of 8-Man’s best signal callers. Defending champion Hanover opens the season as the top team in Class 8-Man, Division II. The Wildcats finished a second consecutive undefeated season by holding off Hodgeman County, 54-48 in the title game. Hanover enters this season on a 25-game win streak. Senior quarterback Daiken Stallbaumer will lead a talented group that also features RB/LB Carter Bruna. Osborne drops down from 8-Man, Division I to Division II this season and figures to challenge for a deep playoff run. Darnell and Darrien Holloway are two of 8-Man’s most talented players. The Bulldogs also have the pieces around them, despite an overall small roster. If Osborne can stay healthy, they could be a serious challenger to Hanover for the state title. Mankato-Rock Hills and Otis-Bison check in to the initial poll at No. 3 and No. 4, respectively. Rock Hills returns a loaded backfield that features Zane Colson (1,500-yard rusher), Rylee Whelchel, and quarterback Dereck Gillett. Otis-Bison will rely on quarterback Anton Foust and an experienced offensive line to get the Cougars through a touch opening test against 8M-I No. 3 Victoria. Rounding out the 8M-II poll is South Barber at No. 5. The Chieftains finished 9-2 a season ago and reached the 8M-II state quarterfinals before falling to Hodgeman County. Five starters return on each side of the ball for South Barber.